BURNABY, BC – Dageraad Brewing has announced the release of a new limited edition Belgian-style ale. This brand-new beer is an abbey-style dubbel that we have briefly fermented with lactic acid bacteria, before boiling and fermenting with a unique strain of yeast from West Flanders that contributes a distinctly plummy taste to beer. Then, late in the yeast fermentation, we added 420 lbs of locally-grown tart Montmorency cherries. The richly malty base beer is brightened by the acidity of both the cherries and the lactic fermentation, and the flavour of the cherries blends seamlessly with the plummy esters from the yeast. This all comes together in a surprisingly light-bodied and decidedly moreish beer. 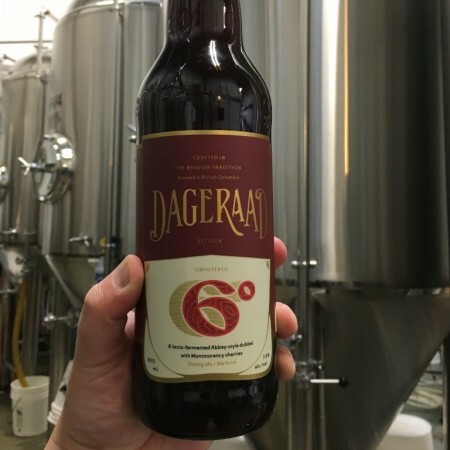 6° is available now at Dageraad, with bottles shipping to select private liquor stores later this week.